Dry and very Hot conditions likely to prevail over many parts of Andhra Pradesh, Telangana, some parts of Interior Karnataka, Tamil Nadu. Strong off shore winds will make sure that temperature will stay 2-3 C above normal in most places in Tamil Nadu, while Heat Wave conditions will prevail over interior parts of Andhra and Telangana. Convective rains are possible in isolated places of interior and South TN. The western and interior part of Chennai will be much hotter reaching close to 39C. Sea breeze will come to the rescue of the city late in the day for Chennai. 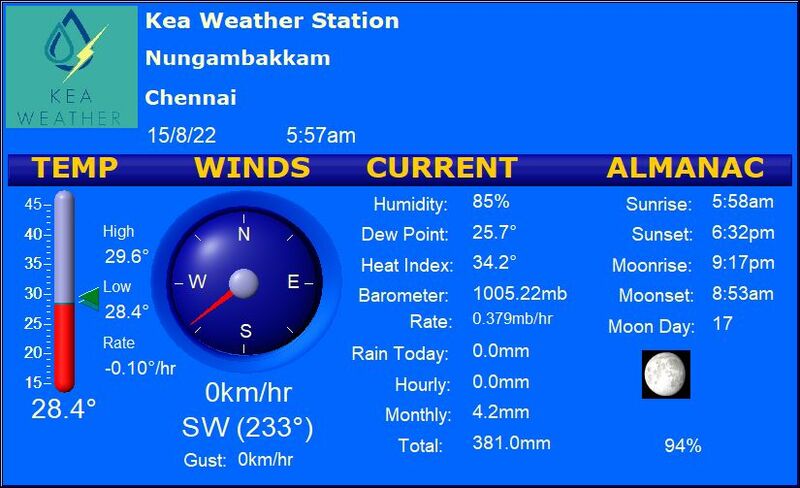 Chennai – Warm and uncomfortable day ahead to look out with the Max around 36 – 37C and Min around 29c with RH max around 82%. Chennai Suburbs to have a degree more than the city. Vellore – To turn out into a hot day with the Max around 40c and Min around 28c with RH max reaching 79%. Partly cloudy skies possible. Coimbatore – Will Have a sunny day with The Max nearing 38c and Min around 23c with RH max around 76%. Trichy – Dry and discomfort Weather likely over the region with Max around 40c and min around 28c with RH max around 71%. Partly cloudy skies possible. Madurai – A hot day with Max of 37C and min around 28c. RH max will be around 73%.